Washington, D.C. MR. MITCHELL: Great. Good afternoon, ladies and gentlemen. Prime Minister Netanyahu has just announced his government’s moratorium on new settlement buildings. I think it’s important to look at this issue in a broader context, particularly how it affects the situation on the ground and how it can contribute to a constructive negotiating process that will ultimately lead to an end to the conflict and to a two-state solution. It falls short of a full settlement freeze, but it is more than any Israeli Government has done before, and can help move toward agreement between the parties. As President Obama has said many times, we believe that a two-state solution to the conflict is the best way to realize the shared goal of Israelis and Palestinians to live in peace and security. It is also in the national security interest of the United States. It is urgently needed…. … while they fall short of a full freeze, we believe the steps announced by the prime minister are significant and could have substantial impact on the ground. For the first time ever, an Israeli Government will stop housing approvals and all new construction of housing units and related infrastructure in West Bank settlements. That’s a positive development. The Israelis have said that the only exception will be a small number of public buildings, such as schools and synagogues, within existing settlements. Under the moratorium, those buildings already under construction will be completed. But the number of buildings under construction will decline since, as each new building is completed, there will not be a new building started. So implementation of the moratorium could mean much less settlement construction than would occur if there is no moratorium…. there will be much less settlement housing construction activity than there would have been if there were no moratorium. That’s a fact…. Nothing like this occurred during the Bush Administration. From 2000 to 2008, there were new housing construction starts on nearly 20,000 new housing units, 9,000 of them between 2004 and 2008. In the moratorium just announced by the Government of Israel, there will be no new housing construction starts during the 10-month period. None. There will be no approval of any housing projects during the 10-month moratorium. None. No Israeli Government has ever taken this step, and nothing remotely like this occurred during the Bush Administration…. while this discussion has understandably focused on the Israeli-Palestinian negotiations, when the President addresses his vision of comprehensive peace, he includes, in addition, Israel and Syria, Israel and Lebanon, and the full normalization of relations between Israel and all of its Arab neighbors. And we’re going to continue to pursue those objectives at the same time with the same vigor…. The Arabs believe that in 1992-96, at the height of the peace process, Israel got a peace dividend, without ending the occupation. Diplomatic recognition of Israel doubled, from 85 to 161 countries, leading to doubled exports and a six-fold increase in foreign investment, while per capita income in the occupied territories fell by 37 per cent and the number of settlers increased by 50 per cent. The settlers now number close to half a million Israelis, including those in east Jerusalem. The system of segregated “bypass” roads, some 600 military checkpoints in an area the size of Lincolnshire or Delaware, and the “separation” barrier that cuts deep into the West Bank, foreclose on any practical possibility of a self-governing Palestinian state. In late 2008, the situation in eastern Syria came to a head when US special operations forces struck at al Qaeda’s facilitation network in the town of Sukkariya near Abu Kamal in eastern Syria, just five miles from the Iraqi border. US troops killed Abu Ghadiya, al Qaeda’s senior facilitator, and his senior staff during the October 2008 raid. …. “However, we started hearing voices rising in Baghdad and calling for the sanctioning of Syria, while forgetting that Iraq is the occupied country and that its people are the ones being humiliated on a daily basis to the point where around four million of them fled the fake democracy that was imported on tanks, a million and a half of whom are currently living in Syria and sharing the Syrian people’s bread, water and electricity. Do these voices want Syria to close its border with Iraq, recognizing the fact that this border is allowing around 2,000 Iraqis to go back and forth every day and that it has become one of the greatest passageways for Iraq and its people wishing to elude the security tragedies seen in their country? The next 24 hours will be critical in terms of the prisoner exchange deal with Israel, senior Hamas sources told Arab media on Wednesday morning. The organization’s leaders, who left Cairo on Tuesday evening, are meeting in the offices of Hamas’ political bureau in Damascus to decide whether to accept Jerusalem’s latest offer. According to one of the sources, who spoke to London-based Arabic-language al-Hayat newspaper, the organization’s leaders – including those who arrived from Gaza – are at odds over the issue. Some believe Hamas should insist on releasing every single prisoner on the list handed over to Israel, while others hold a more pragmatic approach and understand that not everything can be achieved in the negotiations. According to another newspaper, al-Sharq al-Awsat, the deal is being delayed over four names of arch-terrorists, led by Ibrahim Hamed, who was arrested in 2006 for his involvement in deadly terror attacks. Israel, according to some of the reports, is only willing to release him if he is deported outside the Palestinian territories. The three other prisoners delaying the deal, according to the report, are Abdullah Barghouti, Abbas al-Seid, and Ahmed Saadat. But it is the punchline that makes some politicians here cringe: “The obstetrician was Syria,” it says. “We are back to the Syrian hegemony,” said one pro-Western politician who did not want to be identified. “Officially, I am supposed to tell you that this is a fresh start, a new era; that this government will work towards the national unity. But, believe me, everyone is very depressed,” he added. In this case “everyone” refers to the allies of Lebanon’s new Prime Minister, Saad Hariri, who is backed by the US and Saudi Arabia…. But as Lebanon heads towards more uncertainty, one thing is clear – while Washington’s allies may have won the election, many of them say they have lost a much bigger battle. Last week, US Secretary of State Hillary Clinton raised eyebrows in Lebanon when she differentiated between a military branch and a political one in Hizbullah. Clinton’s statement on the Charlie Rose Show came only 24-hours after Saad al-Harriri had created a cabinet of national unity, which includes two members of Hizbullah. Clinton seemingly extended a thin blanket for Harriri to cover himself with—a life jacket—implying that the while the political branch of Hizbullah, represented in the cabinet, was fine, the “military wing” that engages in war, is frowned upon by the US. Not since the US placed Hizbullah on its “terrorist list” in 1999 has such a groundbreaking statement been made by a senior US official…. Jordan’s King Abdullah has dissolved the country’s parliament halfway through its four-year term and called for early elections, state TV has said. No reason was given in the royal edict, but the lower house had been accused of handling legislation ineptly. Critics say that, since being elected in 2007, MPs have failed to address key issues like unemployment and poverty. But opposition MPs said the government had dissolved parliament so it could pass legislation under emergency laws. 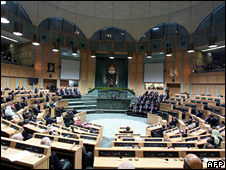 The Chamber of Deputies has the power to dismiss prime ministers and cabinets appointed by the king, and can veto government bills. The cabinet recently failed to get approval for changes to the election law that would have further reduced the influence in parliament of the opposition Islamist group, the Muslim Brotherhood. “Clearly the government wants things its own way,” Hamza Mansour, whose Islamic Action Front is the political arm of the Brotherhood and holds six seats in parliament, told the Associated Press. 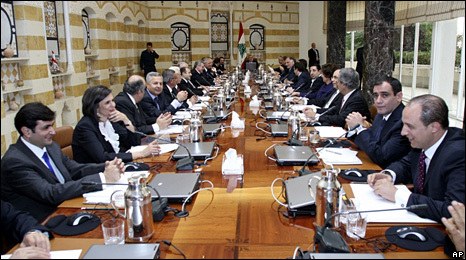 In the last election in November 2007, the Islamic Action Front saw its number of seats in parliament fall from 17 to 6 as a result of the current election law, which reduced the representation of urban areas – traditional Islamist strongholds – in favour of rural areas, which subsequently elected independents loyal to the king. In many tribal areas, each MP represents only 2,000-3,000 voters, compared with more than 90,000 voters per MP in the capital, Amman. The royal decree, issued on Monday evening, told the government to organise early parliamentary elections, but did not name a date. According to the constitution, the new chamber must convene within four months. However, MPs say the king could delay elections. 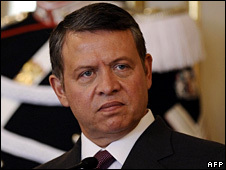 This was the second time King Abdullah has dissolved parliament since he acceded to the throne in 1999. It might be time for Syria to train Iraqi volunteers and to build an Iraqi army that can restore security in Iraq so the Iraqi refugees could return to Iraq. On the other hand Syria should be sure that the Iraqis in Syria are not using Syria’s hospitality to instigate violence and death of Iraqi civilians .